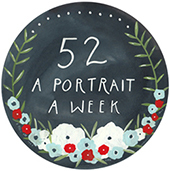 I have been reading about Jodi's 52 A Portrait a Week and admiring everyone's lovely photos for a couple of weeks and saying to myself - that's something I really must do. So with 5/52 I am joining in at Che and Fidel for A Portrait a Week. I'm picking two of my 4 kids each week to take photos of to include, I'd try for 4 but know I'll fail so I'm aiming for two! Baby Boy - Trying on Dad's and Mum;s boots for size, always keen to get outside. Muddy Organiser - Head deep in a book - I love that she loves reading so much. Thank You Jodi for this lovely idea.